PowerMILL 6 includes a new plunge finishing option for five-axis machining of engine ports. DELCAM'S latest release of PowerMILL sets new standards for CAM software across a wide range of industries. PowerMILL 6 includes new functionality for 2-, 3-, and 5-axis machining, plus a number of significant changes to the user interface to make the software even easier to use. Delcam is represented in Australia by Camplex Pty Ltd. It will further reinforce PowerMILL's position as the world's leading specialist CAM software, not only for toolmaking but also for other complex machining operations, such as the manufacture of aerospace structures, blades and blisks, the finish machining of engine ports and the production of composite components. A new 2D Machining Wizard has been added to PowerMILL that offers a much easier and quicker way to generate 2D and 21/2D toolpaths. It covers all stages for working with both 2D wireframe geometry and imported 3D CAD models. When starting with 2D wireframe geometry, the Wizard covers all the steps needed to create the machining model from the profiles. Items, including slots, pockets and bosses, can be created, either with or without draft, and either based on an absolute datum or with reference to previously defined features. Once the model is complete, the full range of roughing and finishing options can be selected, either for individual features or for groups of features. A series of drilling templates was added to PowerMILL 5.5. In the new release, functionality has been added allowing users to create their own drilling methods as well as using the supplied templates. The ability has been added to slow the feed rate in a controlled, automatic way when approaching the bottom of the hole. This is often needed to avoid damage to the cutter if faced with a sudden change in loading. Previously, it would have been necessary to adjust the federate manually after the drilling cycle had been calculated. Machining of flat areas has been improved, in particular to aid in the machining of aerostructures. The setting of levels for roughing of flat areas has been made more efficient. This keeps the total number of machining operations to a minimum and avoids situations where thin slices of material are left to be removed after roughing. A new dedicated strategy has been added for finishing of flats, to give a smoother surface finish. New plunge milling strategies have been added for very efficient clearance of deep pockets in which each plunge is calculated from a stock model that is updated after every cutting operation. Each new plunge centre is determined to optimise the area under the cutter and so give the highest possible material removal without risking damage to the tool. The calculation also ensures that small up-stands of material do not remain since these may crush under the tool if an attempt is made to plunge onto them. A new area clearance sorting option, similar to that already available for drilling, allows rough machining areas to be sorted in a variety of ways. This enables the amount of air moves to be kept to a minimum. Also new is the default thickness command. This can be applied to features such as clamps or fixtures that must be avoided, or to thin walls where extra material must be left on to avoid bending the section during rough machining. Once applied, the offset distance specified is applied to all subsequent toolpaths automatically. Previously, the offset would need to be applied to each individual calculation. For all machining operations, the stock model can now be shaded as well as displayed in a wireframe mode. This makes it easier to visualise the amount of material still needing to be removed when undertaking a series of operations with progressively smaller cutters. New options have been added to the swarf machining functionality introduced in PowerMILL 5. Firstly, support has been introduced for tapered tools. These types of tool are especially useful when machining undercut areas, as they avoid the need to use a long, thin tool for finishing that would otherwise be needed. In addition, they allow more material to be removed than a tipped cutter, with less risk of rubbing on adjacent surfaces. Swarf toolpaths can now be created from wireframe profiles as well as from surfaces. This approach is needed for poor quality data with small discrepancies that would prevent satisfactory toolpaths being generated from the surfaces directly. 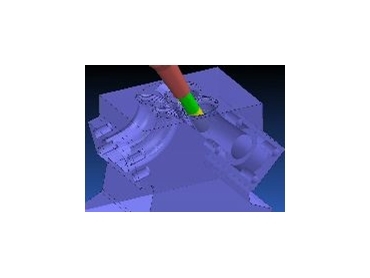 The ability to generate toolpaths by projection through a line was one of the earliest five-axis options in PowerMILL. The software can now produce strategies based on any 3D curve rather than just through straight lines. This gives very flexible control of machining direction when manufacturing complex shapes. Automatic collision avoidance has been added to change the tool axis when collisions might occur. The software automatically tilts the cutter away from the obstacle by the specified tolerance and then returns the cutting angle to the value set for the overall toolpath once the obstacle has been cleared. A special technique for five-axis plunge finishing can be used to mill along a surface rather than across it. This gives efficient metal removal and can be used to produce cusps parallel to the gas flow in engine ports and similar applications.